This 149 page eBook contains over 35 training programs and exercises designed to fit your every need depending upon what time of the year it is. There are pre-season workouts, in-season workouts, post-season workouts, mass gaining workouts, two day a week workouts, three day a week workouts, strength workouts, etc. 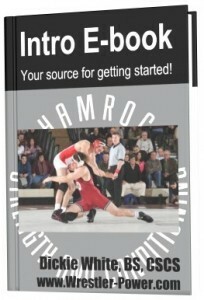 In a nutshell, this eBook has an answer for almost any point in your wrestling career. In addition, I detail the 4 Core Lifts and every tweak as well that I use to help wrestlers become unstoppable on the mat. 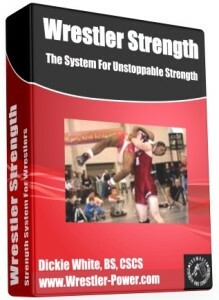 This 95 page eBook covers all of the upper body accessory lifts and grip exercises that should be a part of any successful weight training for wrestling program. The lifts in this eBook are designed to build unbelievable wrestling strength. You’ll be hand fighting better, riding tighter on top, and be able to pressure your opponent with overwhelming upper body strength. This 106 page eBook goes into great depth detailing all of the lower body accessory and core exercises I use with all of my top performing wrestlers. Not only is each exercise detailed and photographed but there are a number of adjustments that are presented depending upon what equipment you have access to at your gym so you’re never unable to perform the exercises that will get you where you want to be! This 133 page eBook contains all the information you’ll need on the types of equipment to use, where to find them, all of the exercises I use with my wrestlers to help them reach their full potential and NO FLUFF. I have not included anything that I don’t have my wrestlers use just for the sake of filling up the book. All of the exercises are used regularly by my wrestlers and are proven to get results. I break down proper technique for every exercise and include step by step pictures as well. Additionally, I detail the specific areas on the mat that each exercise will help you with so you can pick and choose the exercises that are going to best improve your performance on the mat! Also included are 4 templates that cover both in-season and out of season lifting for two and three times per week. Within each template section are a number of sample workouts that I’ve used with my wrestlers to build unstoppable strength and power! This 116-page eBook includes over 70 of the speed and power exercises I use with the wrestlers I train to maximize their power, especially before major tournaments. All of the exercises have private links to videos demonstrating the techniques and there are 5 programs at the end with 51 total weeks of workouts! On top of that, all of the power exercises have been hyperlinked so if you ever have any questions you can just click on it and it will send you to a video rather than having to go back through the entire eBook! An Intro eBook explaining exactly how to attack and how to implement the Bronze Level Weight Training For Wrestling Program successfully. My six principles to designing an effective power and strength training programs for wrestlers, and a step by step process to designing a personalized lifting program tailored to meet your every goal. A 12 Week Pre-Season Program specifically designed for a wrestler who has access to a small, home gym but needs BIG results. 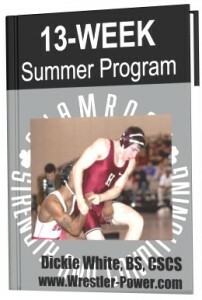 A 13 Week Summer Program designed to help you peak your strength gains while maintaining your weight. A 15 Week Post-Season Strength and Mass Gain Program that will have you bigger and stronger than ever before and just in time for the really heavy summer training to begin! A 19 Week Summer and Pre-Season Program designed to first balance your body, then peak your strength, and finally develop your power and conditioning so you’re ready for Day 1 of practice. In addition, I have 3 “secret” bonuses available on the download page. The Bronze Level Program Package is $27 and can be purchased by clicking the “Add To Cart” Button. 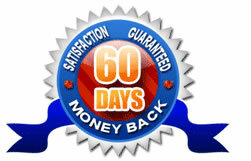 After you click the “Add To Cart” Button, you’ll be taken to Clickbank’s secure payment page. Once you enter your info, you’ll then be taken to a page where you can download your Bronze Level Program Package. Thanks for supporting my business! All Of This For $27?!?! You’re right, this is a lot of content for not a lot of money. But, it’s my mission to help wrestlers get better, not find the quickest way to make a million bucks. So pick up a copy of my Bronze Package today before my wife finds out I’m practically giving it away and makes me raise the price! …Believe me, she’ll do it, and I know better than to argue with her! !